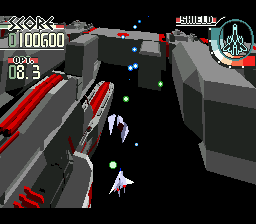 Silpheed is a shoot-em-up that was originally released on the Japanese PC-8801 home computer in 1986. Piloting the SA-77 Silpheed space craft, your mission across 11 stages is to save the Grayzon System by wiping out the terrorist group called Zakalite. Four main weapons are available (e.g. Forward Beam, Auto-Aim) which can be customised prior to each stage, as well as four Optional Weapons (e.g. Bombs, Torpedoes) that are randomly assigned. The SA-77 Silpheed can withstand six bursts of damage, but repairs can be obtained by collecting various items in battle. Creatively, the game is very ambitious and the cinematic, polygon-heavy cut-scenes in the introduction are mind-blowing for a 1993 game! I also like the ability to unlock new weapons and customise which ones to use prior to each stage, as it adds strategy and replayability. Stage 2 is intense as it involves dodging incoming meteors while shooting down enemies. Likewise, Stage 3 has impressive 3D visuals as you swoop around a huge enemy ship before diving in for a Trench Run battle. The game does a good job of keeping the action fresh, as other stages even include morphing scenery. Silpheed's main problem is that it's simply too hard! Right from the start, enemy ships and bullets litter the screen and evading them is tough due to their ridiculous speed of travel and the fact that they require multiple hits to defeat (making you constantly feel under-powered). The backgrounds don't help either as sometimes bullets blur into the scenery. What makes this game ultra frustrating for shoot-em-up novices is that each time you die you're taken back to the start of the level; this is too punishing in my opinion and discourages you from progressing. Your ship doesn't even recharge energy after completing a mission so death quickly becomes an inevitability! Silpheed is a terrific shooter with engaging level design and awesome visuals, and from a creative point-of-view it really does achieve everything it sets out to do. However, it never quite reaches its true potential due to its brutally challenging gameplay and severely feeble weapon set. Random trivia: A sequel called Silpheed: The Lost Planet was released on the PlayStation 2 in 2000.